Citizen IDP-3535 - Impact, two-color printing, 4 lps, serial interface. Includes power supply. Order cables separately. See accessories. Color: white. 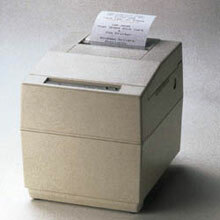 High speed economy printer for bankcard, POS, fast food, restaurant and convenience store use. The iDP-3535 is a high speed economy printer for bankcard, POS, fast food, restaurant, and convenience store applications. BLACK RIBBON FOR IDP3535,3550, CBM750, IR-61B, Single Ribbon. RED/BLACK RIBBON FOR IDP3535,3550, CBM750, IR-61. 6 ribbon case. The Citizen 3535F-40RF120 is also known as Citizen America	CIT-3535S	or 3535F40RF120	.